IF YOU DON’T MAKE A STAND FOR LIBERTY AND OUR CONSTITUTION, THIS IS WHAT THEY HAVE PLANNED FOR YOU. One of the Sheriff’s Deputies who was forced to enter the apartment where Ebola victim Thomas Eric Duncan stayed before he was taken to hospital has fallen ill.
A statement issued by the City of Frisco, a suburb of Dallas, suggests that a second potential Ebola victim has been taken to the Presbyterian Hospital in Dallas, the same facility where Duncan stayed before his death this morning. However, according to a Dallas Morning News report, the individual was one of the Sheriff’s Deputies who was forced to enter Ebola victim Duncan’s apartment last week. 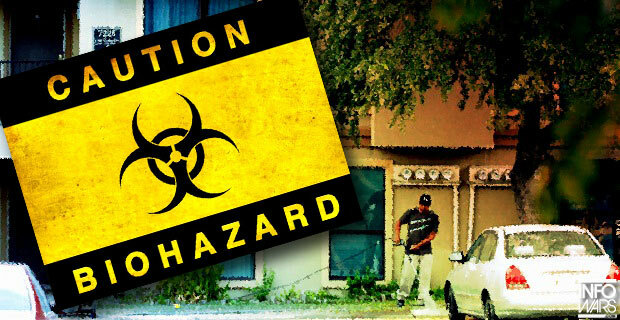 Duncan’s family told the media that they received no advice from the CDC on how to go about cleaning the apartment and it was a number of days before a professional Hazmat team arrived to clean the building. 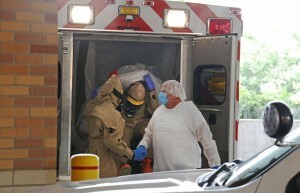 Confirmation that the second potential Ebola victim is a Sheriff’s deputy who entered Duncan’s apartment would represent a huge embarrassment for the CDC and Sheriff Lupe Valdez, who gave the order to send the men into the apartment. As we reported last week, Dallas County Sheriff’s Association President Christopher Dyer criticized the decision, suggesting that the Sheriff’s deputies and their families were unhappy at having to potentially expose themselves to the virus. Infowars spoke with the CDC last week who said that the apartment in which Ebola victim Duncan stayed should have been cleaned right away. Images taken from a news chopper also showed unprotected workers cleaning the sidewalk with a pressure washer near Duncan’s apartment where eyewitnesses said he had vomited before entering an ambulance. Frisco officials say the chances are small that the ailing sheriff’s deputy who visited Thomas Eric Duncan’s apartment has Ebola. Frisco Fire Chief Mark Piland says the deputy is not among the 48 being monitored closely, and health officials are treating this “as a low-risk event.” He says the patient told CareNow workers he’d been in Duncan’s apartment. Piland said the patient was “minus a few” symptoms of Ebola, but he exhibited enough to trigger the preliminary screening process. The ambulance that carried Deputy Michael Monnig from an urgent care facility in Frisco to Dallas is being decontaminated at Texas Health Presbyterian Hospital. Denton County health officials are working through decontamination procedures for workers who came in contact with the sheriff’s deputy. Piland says Frisco Fire-Rescue has been training for an Ebola case for several weeks and followed all CDC procedures. The Frisco patient has been identified by his family as sheriff’s Deputy Michael Monnig. The man’s son said his father had been monitoring his temperature since last week and went to the clinic out of an abundance of caution, our Eva-Marie Ayala reports. The deputy told his family he had stomach pain and fatigue. Because the symptoms came after a visit to Duncan’s apartment, he decided to play it safe and get checked out. The Department of State Health Services says the Dallas County sheriff’s deputy who went to an urgent care clinic in Frisco complaining of Ebola-like symptoms was not among the 48 people under close monitoring. Frisco officials say the patient claimed to have come in contact with Thomas Eric Duncan, but the state says there was no direct contact between the two men. “We understand that anyone near the Dallas response will be very concerned about any health issues they experience, and we want them to report those issues so we can check them out quickly,” the state agency said in a written statement. A Dallas County sheriff’s spokeswoman said the deputy, whose name is not being release, expressed concern about his health Wednesday. Sgt. Chris Dyer, president of Dallas County Sheriff’s Association told our colleagues at KXAS-TV (NBC5) that the deputy is not exhibiting classic symptoms of Ebola such as a a high fever. Rather, he said the deputy didn’t feel well and went to see a doctor. Dyer said that the deputy and four other deputies accompanied Dallas County health director Zachary Thompson into the apartment, most without protective gear. “I want to make sure that Dallas County and the Dallas County Sheriff’s Department is doing everything they can to keep us safe,” Dyer said. He said deputies met Friday with health officials and heard a presentation about Ebola. The association suggested they take their temperatures twice a day. Some had returned to work and some hadn’t, he said. A vehicle cordoned off in the CareNow parking lot is registered to a Dallas County sheriff’s deputy who went into Duncan’s apartment last week, according to a story that appeared on WFAA’s website earlier this week. Our Naheed Rajwani and Holly Hacker report that the patient arrived about 3 p.m. at Texas Health Presbyterian Hospital in North Dallas, where Duncan died this morning. When the ambulance arrived, the driver got out wearing a beige full protective suit. He and a second paramedic in full protective gear escorted the man inside, one of them with a gloved hand on the patient’s back. The patient wore blue shorts and a white plastic cap, with a blue mask over face. Others around him wore no protective gear. Hospital officials released a statement saying they are prepared to give the man the care that he needs and determine what exactly he’s suffering from. In Frisco, other patrons and staff at the urgent care clinic were being examined and may also be taken to a hospital for further monitoring. CareNow spokeswoman Vickie Johnson said the patient checked “yes” to one of the screening questions regarding travel to West Africa. People at the Frisco shopping center surrounding CareNow have mixed feelings about the disease’s possible spread and health officials’ ability to keep people safe, our Valerie Wigglesworth reports. “I’m scared,” one man who stopped to check out the scene said. Larry Payton of Little Elm had stopped at the Valero gas station next to CareNow to check out the scene. He said he wasn’t that concerned about getting Ebola but suggested quarantines for people coming from West Africa. “There’s no sure way of stopping it,” he said. She said people have been joking about ebola in Dallas. “It just goes to show you you can’t get away from it,” she said. Nick Foster, who works in Frisco, said he thought police and fire personnel outside the Care Now should be taking better precautions, like wearing gloves and masks. “I was just starting to relax” about the Dallas case, he said, adding that this possible Frisco case makes him nervous. “It’s the first time we’ve ever had anything this serious in the U.S.,” he said. Update at 2:30 p.m. from Eva-Marie Ayala: The CareNow is on the Denton County side of Frisco. As the clinic serves those in both both Denton and Collin counties, officials from both will monitoring the situation. Collin County Judge Ketih Self said he was informed of the situation and understands about 13 people were at the clinic when the patient was there. He said he is uncertain where the patient lived or any other details. “We don’t know what the situation is just yet,” Self said, noting that law enforcement was at the clinic to help assist. Update at 2:11 p.m.: The patient, dressed in shorts and wearing a surgical mask and a plastic head covering, just walked out of the facility and into the ambulance, which had been covered in plastic. That patient will likely transported to Presbyterian Hospital in Dallas, where Thomas Eric Duncan was hospitalized. We are working to determine if this person is among the 48 people the Centers for Disease Control is monitoring. So far there has been no comment from the CDC, which already had a 3 p.m. press conference scheduled. There are also conflicting reports concerning the patient. Frisco officials earlier said he claimed to have had contact with Thomas Eric Duncan, but Care Now says he told them he’d been to Africa. Update at 2 p.m.: Frisco paramedics, dressed in protective gear, are preparing to transport the patient to a hospital. It’s unclear which one. At 12:32 p.m. today, October 8, Frisco dispatch received a call from Care Now, 301 Main Street, regarding a patient exhibiting signs and symptoms of Ebola. The patient claims to have had contact with the Dallas ‘patient zero’. Frisco firefighter-paramedics are in the process of transporting the patient. They are also in the process of examining clinical staff and other facility patrons. That number other people impacted is unknown. No other information is confirmed, available at this time. A news conference is scheduled for 3:30 p.m. TODAY. It should be noted: This is not a confirmed case of Ebola. It is not known if this person did indeed have contact with Duncan, who died this morning at Presbyterian Hospital. And health officials have yet to say anything concerning the Frisco call. Updates, of course, are they are made available. We will carry the press conference at 3:30 p.m.